When Mac users need to create a database, they turn to FileMaker Pro more often than not. But for less complex tasks—cataloging the media you own, managing contacts, or keeping tabs on a project—an individual user firing up FileMaker is a bit like grabbing a hammer when you need a flyswatter. It’s overkill. FileMaker seems to recognize that dilemma. So it’s created a database program in the vein of Apple’s own iWork productivity suite (which, in itself, is hardly a surprising turn of events since FileMaker is an Apple subsidiary). The newly unveiled Bento is a lightweight personal database application that, at its core, is about making databases accessible and easy for the casual use—you might call it FileMaker Lite, though that’s in no way intended to slight the impressive amount of functionality built in. Bento is available as a free public preview in advance of its planned January 2008 release. I’ve had a chance to spend some time with FileMaker’s latest database program, and here’s what you can expect if you download the preview. The developers at FileMaker realize that many casual users have similar needs and desires when it comes to creating databases, so they’ve provided more than 20 pre-built templates for information like Home Inventory, Digital Media, Classes, and more. Bento offers a number of pre-built templates to help you get a jump start on building your personal database. Getting started is as easy as picking a template or, if none of the included ones meet your needs, tailoring an existing template to your liking or creating one from scratch. FileMaker touts one-click customization in Bento, which lets you adjust everything from text sizes to shading and alignment. 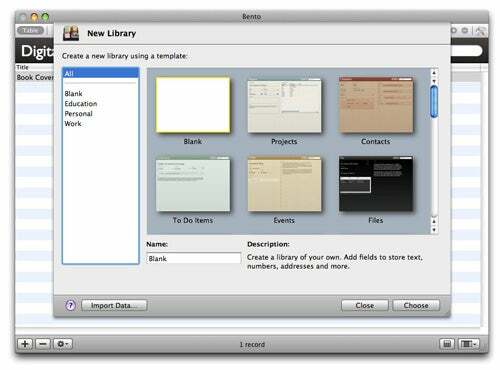 Bento’s look, inspired by the likes of iTunes and iPhoto, will be familiar to most Mac users. The main window is divided into three columns: the left hand is a source list that holds your databases, which Bento calls “libraries,” and their “collections,” the Bento equivalent of playlists. Bento can link automatically into OS X’s Address Book and iCal, letting you easily pull information from those sources to use in your other libraries; that information is also live, meaning that changes you make there will be reflected in Address Book and iCal. You can also create smart collections, akin to iTunes’ smart playlists, which select a set of records based on criteria that you specify. The middle column is Bento’s main canvas, where you work with the content itself. At the top, a toolbar lets you toggle between different views: every library has a table view, which lets you look at your data in a spreadsheet-like fashion, and a form view, which lets you view, enter, and edit details about a particular record. You can create multiple form views for a library via a simple drag-and-drop interface, in case there are different ways in which you want to interact with the data. In the right-hand column are the fields for the current library: for example, a database of contacts would include fields for name, address, e-mail, phone number, and so on. You can create new fields from any of 19 different included types, such as checkboxes, drop down menus, and text boxes. Adding a new field to a form view is as simple as dragging-and-dropping it. 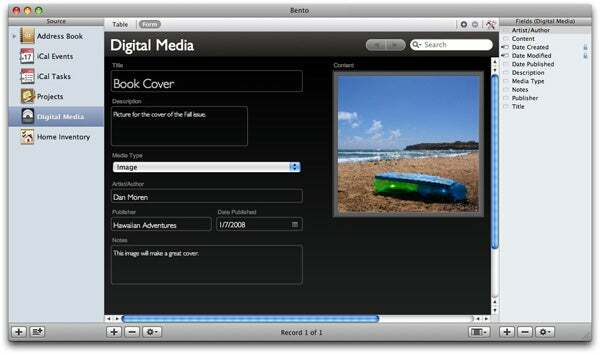 Bento even allows you to embed media like images, sounds, and videos into a record, though there is no direct integration with your iLife media. The form view in Bento lets you view and alter details for an individual entry—in this case, a library I created to keep tabs on media assets. While Bento puts a friendly face on databases, it comes at the sacrifice of some of the higher-end functionality. It’s not an application for those wanting to do complex SQL queries or share a database over a network with multiple users. Bento also stores its database in its own proprietary format, and while you can export to a plaintext Comma Separated Values format, you won’t find any other means of exchanging information with common database programs like Microsoft Access, mySQL, or even FileMaker Pro. One major advantage Bento holds over its big brother FileMaker Pro is price—the current version of the venerable database program goes for $299 while a single copy of Bento will set you back just $49. A family pack of five licenses costs $99. Because Bento leverages some of Leopard’s new features—specifically Core Animation, live linking to iCal data, Time Machine backups, and other Leopard-specific capabilities—it only works on Mac OS X 10.5. That’s true of the currently available preview, as well as the final release slated for January. Macworld will have a full review of Bento once the final version arrives.